The Gunnison Gorge National Consersvation Area was preserved with money from the Land and Water Conservation Fund (Photo courtesy of visitmontrose.com). The U.S. Senate on Tuesday approved the Natural Resources Management Act that includes permanent reauthorization of the Land and Water Conservation Fund that Congress allowed to expire last fall. The “lands package” still has to be approved by the House and signed by President Donald Trump. The LWCF, which dedicates a certain percentage of offshore oil and gas drilling fees to land, water, open space and outdoor recreation projects around the nation, has pumped more than $268 million into Colorado projects. The LWCF still is not fully funded under the Senate bill. Colorado conservation groups, politicians and stakeholders have been pushing hard for renewal of the LWCF since it expired Oct. 1, including at an event in Avon last fall. (Feb. 12, 2019) Denver, Colo. – The United States Senate has voted to advance S. 47, the Natural Resources Management Act. Importantly, the bipartisan legislation permanently authorizes the Land and Water Conservation Fund (LWCF), which has been expired since September 30. The legislation now goes to the House of Representatives where supporters are urging quick passage. For more than half a century, LWCF has used a portion of federal offshore energy revenues — at no cost to taxpayers — to conserve our lands, water, and open spaces and protect the outdoor recreation opportunities they offer. 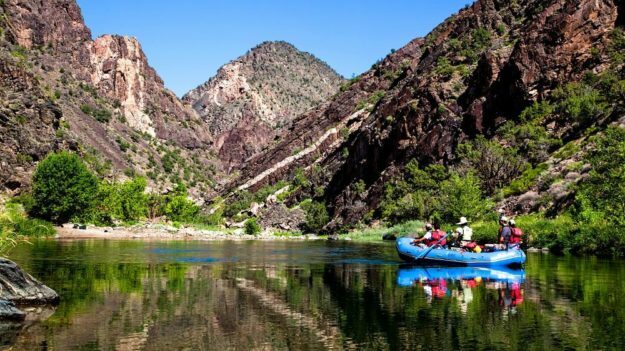 LWCF has invested over $268 million in Colorado, helping to secure access and conserve special places across the state, including the Gunnison Gorge National Conservation Area, Great Sand Dunes National Park and Preserve and boat launches on the Colorado River. Washington, D.C. – Colorado U.S. Senator Michael Bennet today applauded Senate passage of the Natural Resources Management Act, commonly referred to as the “lands package.” Bennet secured 10 provisions in the package that will improve land management and expand access to public lands in Colorado. Additionally, after a decade of fighting to save the program, Bennet helped secure permanent reauthorization for the Land and Water Conservation Fund (LWCF). Since joining the Senate in 2009, Bennet has advocated for LWCF reauthorization. He has led the effort in Congress with Senator Richard Burr (R-NC) to permanently reauthorize the program, introducing bipartisan legislation in 2015, and in every Congress since. When LWCF expired in September 2015, Bennet spoke on the Senate floor and wrote letters to leadership to help secure a three-year authorization in the end-of-year spending bill. When the program was set to expire again in September 2018, Bennet worked with Burr to file an amendment to the Farm Bill and other bills moving on the Senate floor and introduced a separate bill with Senator Maria Cantwell (D-WA) to permanently reauthorize and fully fund LWCF. Today’s lands package includes permanent reauthorization for LWCF. Over the years, Bennet has visited several LWCF-funded projects in Colorado, including the Animas River Trail in 2016 and the Yampa River Project in 2018, to advocate for the program. LWCF has invested more than $268 million in Colorado projects since its inception. In addition to LWCF, Bennet helped secure 10 provisions in the lands package that improve land management and expand access to public land in Colorado. This includes the 21st Century Conservation Service Corps Act, which Bennet led with late-Senator John McCain (R-AZ) beginning in 2015, to place youth and returning veterans in national service roles to enhance America’s public lands and waters. It also includes bills to designate Colorado peaks in honor of distinguished mountaineers; begin the process of establishing the Pike National Historic Trail; protect an important view shed near Rocky Mountain National Park; and expands sportsmen access, among others. A summary of the Bennet-led provisions included in the lands package is available HERE. The text of the Natural Resources Management Act (S. 47) is available HERE.